Skin Tip: Satin Pillowcases for Wrinkles! If you notice you wake up with sleep wrinkles in the morning, it can be caused by the friction between you and your pillow. Unless you sleep on your back, satin or silk pillowcases may be worth looking into as they slide rather than pull against your skin. Bonus tip: they can also help reduce frizzy hair! Skin 411: A Word About Ingredient Names You Can’t Pronounce! When it comes to reading ingredient labels, I’m sure you’ve heard that if you can’t pronounce an ingredient or the name is too long, it’s automatically bad for you. Well, that’s actually a myth as many skincare companies adhere to the International Nomenclature of Cosmetic Ingredients (INCI) system, which is an internationally recognized way of standardizing labels on cosmetic products. For example tocopherol acetate, tetrahexyldecyl ascorbate and butyrospermum parkii sound scary but they are actually alternative names for vitamin E, vitamin C, and shea butter. Remember that whether you can pronounce an ingredient name or not tells you nothing about the safety of it. If you’ve never really had sensitive skin but all of a sudden you’re experiencing irritation, you may have sensitized skin. Sensitized skin can be a result of stress, hormonal fluctuations, smoking, alcohol, poor diet, medical procedures, over-exfoliated skin and fragrance. Eliminating or controlling these factors should help you get your skin back to normal. 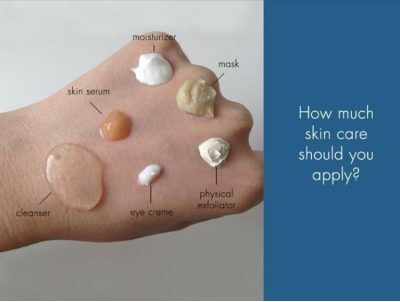 Skin Tip: Skincare Application Tips! Ever wonder how much skincare product you need to use during your daily regimen? Use this visual, courtesy of Bioelements, as a guide.